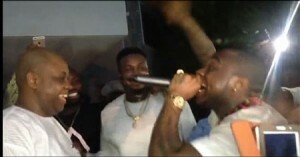 Nigerian singer and rave-making artist, Davido has brushed aside the current family issues trying to rock his life as he delivered a super performance in far away Gambia. Not only that, the handsome HKN label singer was joined on stage by his billionaire dad, Elder Deji Adeleke who had beautiful singing moment with his son. The duo sang together in a club somewhere in Gambia.